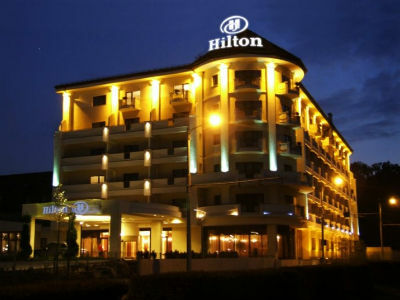 location: Set in the medieval town of Sibiu which was voted Europe's Cultural Capital in 2007 the Hilton Sibiu hotel in Romania offers a perfect combination of contemporary conveniences a beautiful culturally rich location and a wealth of recreational amenities. restaurant: Madrigal Restaurant -Savor lunch or dinner in this warm and welcoming restaurant and allow our professional staff to help you. Camara Boierului - Experience authentic Romanian specialty cuisine featuring a combination of unique and delicious flavors and dishes from Transylvania in a traditional atmosphere in Camara Boierului at the Hilton Sibiu hotel. English Bar - The English Bar in the Hilton Sibiu hotel is the perfect place to relax and enjoy one of the many varieties of delicious coffees or an excellent cocktail prepared by our experienced bartenders. Versailles Restaurant - Enjoy fine French Dining in this elegant a la carte restaurant which is decorated in an elegant 15th Century style. Sip a glass of specially chosen wine in the warm and welcoming Versailles Restaurant at the Hilton Sibiu hotel. exterior: Modern facade lobby: Large lobby general: All of the spacious Guest Rooms and Executive Suites are elegantly furnished and feature Crabtree - Evelyn toiletries the very latest in audio-visual technology a balcony overlooking the Dumbrava Forest and complimentary access to the Spa. Wireless internet access is available in all public areas of the hotel. Choose from three restaurants where you can dine on international French and Romanian specialties and savor an after dinner cocktail or glass of fine wine in our relaxed English Bar. Plan a meeting or celebrate in one of our 4 flexible meeting rooms or choose our spectacular grand ballroom which holds up to 400 persons. Treat yourself to a massage or treatment in our luxury Spa practice your serve on our 2 tennis courts and enjoy a relaxing dip in our indoor swimming pool.